Archery! Click here to view the dates! Come down to the castle and have a go at Archery with the Mobile Archery . For all ages and abilities! Can you pop the balloons? Who will get the highest score? Then relax and enjoy some refreshment in our gardens and wander around our beautiful Norman Castle by the sea. *Normal Admission applies. Family ticket Castle Entry only £15. 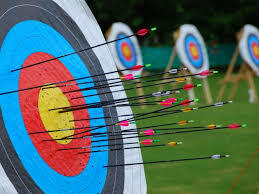 Archery £1 per go for Adults, Children – First go free, then £1 per go!